Accolades and praise for the book Divine Revelation is contained in this page. You can read testimonials and endorsements from best-selling authors, the media, the press, New Thought ministers, and grateful readers. "This inspiring and helpful book gives tremendous insight into what spirituality is, how it works, and how to use it daily. It can transform your life. Read it!" --John Gray, Ph.D., best-selling author of Men Are From Mars, Women Are From Venus. "Divine Revelation is a triumph! At last, there is a way to hear the "still small voice" within-this book tells us how. It moves us into higher awareness. With this book we can learn intuition safely, with practical, easy techniques that anyone can do. Reading this book can be a life-transforming experience!" --Gerald G. Jampolsky, M.D., best-selling author of Teach Only Love and Love Is Letting Go of Fear. "Congratulations on a fine achievement. In this wonderful book, Susan Shumsky reveals a secret of the ages: The treasure is hidden in plain sight-within us. For those seeking spiritual understanding, this book can come as a revelation. This book contains no second-hand advice: Shumsky has been there. That's what makes her a great teacher. A valuable commentary." --Larry Dossey, M.D., best-selling author, Healing Words, Meaning and Medicine, Recovering the Soul, and Space, Time, and Medicine. "Susan Shumsky's book, Divine Revelation, gives a comprehensive overview of the new popular spirituality of our time. She includes a clear, simple description of how to differentiate between the various inner voices and how to connect with clear, divine guidance for personal use. She also describes the problems and pitfalls of the many types of "psychic phenomena" of the popular media today. I recommend this book as a basic primer to people who wish to make a better connection to their inner divinity and reorient their lives toward a divinely centered and inspired life." --Barbara Brennan, best-selling author, Hands of Light and Light Emerging. "Susan Shumsky wrote a book that helps people who are beginning to look at their spirituality and to search for it. She spent a lot of time studying yoga techniques in ashrams in the 60s and 70s. This is a really good book written by a person who is helping contribute immensely to the way the world is transforming." --Dannion Brinkley, best-selling author, Saved By The Light and At Peace In The Light. "If you've been searching for your soul, you can find it with this book. It contains powerful methods to overcome stress and heal deep emotions. This is a do-it-yourself practical kit for spiritual therapy. God's light shines through this book. Please read it now." --Harold H. Bloomfield, M.D., best-selling author, Love Secrets, How to Heal Depression, and The Power of Five. Divine Revelation is a breakthrough! Finally, anyone can learn to listen to his or her inner voice." --Peter McWilliams, best-selling author, Life 101. "A profound and very important book. A wonderful synthesis of spiritual wisdom and practical steps, based on the experiences of a true seeker. A "self-help" book in the true sense. Susan Shumsky has done humanity a great service in writing this book, and you will do yourself a great service by reading it." --Peter Russell, best-selling author, The Global Brain and The White Hole in Time. "Divine Revelation, a selection of Book-of-the-Month's Club's One Spirit division, is about learning how to listen to the small, still voice within you and using it in everyday life to discover direction and inner purpose, among other goals. To help readers get past the 'ego-chatter' cluttering their path to the spirit, Shumsky devotes a chapter to 'Nine Tests to Prevent Psychic Deception.'" --Publisher's Weekly BEA Show Daily. "Divine Revelation shows readers precisely how to access their divine internal wisdom. Exercises in the book include silencing chatter in the mind, testing the source of received messages, and finding answers to our most difficult questions. Also included are true-life stories of people who have used the plan with positive results. This book is for those who want a blue-print for meditation and inner wisdom." --New Age Retailer. "This is a pragmatic, down-to-earth, comprehensive book written by a self-confessed 'ordinary person' who reassures us that if she can do it, so can we. She does not proscribe religious belief but shows the common elements in many religions that support the work she is doing. She lucidly spells out the how-to's for spiritual breakthrough, providing nine tests to be sure the source of your message is indeed divine. Lots of pre-pub endorsements suggest a work with widespread appeal." --Napra Review. "This book will teach you how to get in touch with your inner capacity for spirituality and will greatly enhance your life." --Alan Caruba, editor, Bookviews. "I learned from Susan, meditation is not what you think, but then again her inner voice has call-waiting. She is more divine than Bette Midler or my world-famous cheesecake. She has spiritual value and a good sense of humor." --Joey Reynolds, WOR, New York. "Susan Shumsky-informative, compelling and entertaining. What more could you want from a talk show guest? It was a pleasure for me and very easy to interview her." --Paul Gonzales, United Broadcasting Network, 75 affiliates. "Susan's practical, clear, non-threat advice and easy rapport with listeners, along with fresh insights into an age-old quest, made for several hours of lively, action-packed radio." --Laura Lee, The Laura Lee Show, syndicated: 70 affiliates. "If you're walking down the yellow brick road to 'enlightenment,' do it with Susan Shumsky-the 'Spiritually Street-Smart' guru. Susan is amazing. She's terrific-a real dynamo!" --Robbie Patterson, Synergy Broadcasting, syndicated: 100 affiliates. "Every once in a while a new book comes along that gives you a certain feeling. There's something special about the book. When I read it, I felt incredibly relaxed. I felt, to a degree (as crazy as it may sound), spiritually enlightened. Even if you are not seeking spiritual knowledge or spiritual awakening, but you are aware of the stresses in your life, then this book is a MUST READ." --Steve Bastien, WCBR Radio Chicago. "The thing I like about Divine Revelation is that it gives us tools, step-by-step procedures to follow the spiritual path and how to discern that voice and begin using that kind of peacefulness in our lives in a very positive way right away." --Bonnie Colleen, KEST Radio, San Francisco. "Susan Shumsky is a dream guest." --Vera Armin, Alive! Body, Mind, and Spirit, Brookline TV, Boston, 40 affiliates. "I want to compliment you on your fine book, Divine Revelation. You have a fresh and valid approach that I personally like and endorse." --Dr. Anita Richelieu, Co-Paster, Church of Religious Science, Redondo Beach, CA. "In Divine Revelation, Susan Shumsky truly opens our "doors of perception" and takes us to levels of higher consciousness. Her book is both inspiring and practical. The case histories of those whom she has taught the techniques of Divine Revelation are eloquent evidence of the effectiveness of meditation and spiritual dedication. This remarkable book speaks to everyone. --Donald Curtis, founder and minister, Unity Church of Dallas and author of nearly thirty best-selling books, including Helping Heaven Happen, Your Thoughts Can Change Your Life, and Human Problems and How to Solve Them. "Divine Revelation promises fulfillment of a deep human longing-to contact the Divine Mind directly, in whatever form we believe it to be. This book speaks to all people, no matter what their religious background. Many books advise us to listen to our heart, yet they fail to tell us how. Divine Revelation teaches a safe, practical way to do this. Instead of developing psychic powers, as many books do, this book opens us to genuine spiritual awareness and develops our prayer power. Divine Revelation reduces many pitfalls in our quest for inner truth. It shortens the time required for our pathway to the divine. Reading this book is a spiritual adventure!" --Dr. H. Fred Vogt, minister, Mile-Hi Church of Religious Science, Denver, Colorado. "Divine Revelation is a breakthrough in the field of intuitional development! It helps us not only to listen to our inner voice, but also to recognize who or what that voice is. Using this book's simple techniques can heal our minds and bring us in tune with God. This book helps us remove blocks so we can experience our true self. It opens our awareness to God. This book helps us develop faith in our own inner voice rather than depending on others for advice. Divine Revelation is a wonderful companion on the spiritual path." --Dr. Jack Holland, founder, Institute for Human Growth and Awareness, San Jose, and author of Your Freedom to Be and Man's Victorious Spirit. "Divine Revelation goes beyond intuition. It promises direct spiritual experience and takes us to higher consciousness. This book helps us avoid the perils of dabbling with psychic powers. It develops our spiritual discernment. It helps us to become spiritually self-reliant. Thank you, Susan, for your safe, practical approach to intuitive development." --Dr. Barbara King, founder, Hillside International Truth Centers, and author, How to Have a Flood and Not Drown and Transform Your Life. "For the first time in my 15 years of reading metaphysical books, one has come along and describes the dangers of getting involved with expanding and opening your mind if you don't know what you're doing AND shows you how to deal with them, protect yourself, and PROPERLY receive higher, spiritual guidance. I had some very negative experiences with 'astral entities' as they're called in the book, almost prompting me to abandon my spirituality altogether. But, after reading the chapters on protection, healing, and becoming "spiritually street-smart", I am now confident that I can contact the divine at will and know it will be safe, loving, and comforting. Thank you, Susan Shumsky, for finally bringing to light a safe and workable method for connecting to God on a regular basis for the benefit of your own life and all life."-P. G., West Palm Beach, Florida. "I've got a long way to go before I master your book, but already I feel a peace I've never known in my life of 46 years." --J.C., Cypress, Texas. "This book has changed my life. I had been trying to get spiritual experiences for the last 20 years. However, after searching for the answers in gurus and cults, and after coming to the realization that they were all phony, I simply gave up. Just when I thought that I would never find any real answers, this book 'jumped off the bookshelf' at me. I can't begin to tell you what it has done for me. I had been in deep depression, in fact, with no hope for tomorrow. This book has given me hope that there really are true spiritual people in this world, people who will help you find the answers within yourself rather than puffing up their own egos. Susan G. Shumsky is one of these people. I came all the way from Japan to meet Susan just to thank her for this wonderful life-transforming book." --J.S., entrepreneur, Tokyo, Japan. "Your book is helping me to look at fear, and to learn to protect myself from it. Also, that there can be no fear when love is present. God does send angels when we need them, and you are one. I consider your book and your message to be one of the great gifts of my life, and I thank you." --J.T., San Diego. "What caught my interest was these words: 'Identify the source of intuitive messages and avoid psychic deception.' Having my head sitting squarely on my shoulders (I see myself as a skeptical believer/believing skeptic) those words told me something significant. Most (New Age) people seem to just accept any old message received in any supernormal way as valid. I thought, 'this one's on to something. . .' I immediately saw that here was something extremely useful-useful in getting 'glimpse of the divine.' (That phrase really went straight to my heart.)" --H.D.R., Lund, Sweden. "I have begun to use the methods of spiritual healing in the book and am surprised at the result. My friends seem to relate to me on a more clear level, honoring my integrity and quality of being. And are less possessive and are more tolerant and loving towards me, less conditional love. I can see them changing for the better in their relationship with me. It's more clear, mature, and the muddy emotional imbalances seem to be less." --J.U., Point Roberts, Washington. "I am truly uplifted by having just completed and starting my second reading of Divine Revelation. Just the thought of finally making contact with a real source to help me develop what I have known was available within me for years! Allahu Akbar (God is Great)!" --S.S., Newark, N.J.
"Reading your book (again and again and again), meeting you, experiencing your Breakthrough Intensive Workshop, I feel blessed and privileged to have received all these gifts. Divine Revelation is far and beyond anything as deep and powerful as I have ever known, and I give thanks for it daily. This book has had a profound effect on the level of joy and happiness I now experience daily in my life. Like a stone hitting a still watered pond, it ripples ever wider and deeper each day that passes. Its most powerful effect is it establishes a link with what cannot be seen and brings us to feel and know what is real and can be felt and experienced." --J.L., businessman, New Rochelle, N.Y.
"Divine Revelation has truly changed my life. The book is fantastic!" --L.S., Jericho, N.Y.
"I have read your book, Divine Revelation, and I have been doing the meditations for a few weeks now. I am absolutely thrilled. I am already getting great results in my life. I am very grateful for the knowledge you have passed to me through your book. Thank you." --M.W., Stockholm, Sweden. "Susan Shumsky's brilliant, unique and accessible handbook, Divine Revelation, offers a real solution to cult seduction and the resulting loss of free will and positive life accomplishment. This book helps people learn to hear the 'still small voice' within, their spiritual guidance. Of critical importance, it also gives the Nine Tests to Prevent Psychic Deception. With today's vast trend of people seeking spirituality and seeking out spiritual advice, Susan's approach is immeasurable valuable in preventing people from being led astray from their true lives of accomplishment and fulfillment, on to paths of unknown pitfalls." --N.R., professional fund raiser, Scottsdale, Ariz.
"Your book is fantastic. I marked it up so underlining and writing in it that I had to order another copy." --Dr. R.B.G., minister, Huntsville, Ala.
"Your book is truly wonderful! It is obvious that you have travelled into deep territory in order to write such a definitive work. I am really impressed with what you have created and with your understanding of the Way. It is an incredible book." --R.P., magazine editor, Corte Madera, Calif.
"Your book is an incredibly detailed coverage of spiritual transformation. You have done your homework exceptionally well, and I would recommend this book to anyone seeking their Higher Power." --Dr. D.M., clinical psychologist/author, Birmingham. "Thank you so much for your wonderful book. It has answered many questions I have and is a delightful change from always looking to others for the answers." --D.S., Atlanta. "Divine Revelation is the only technique that enables me to feel uplifted and positive outside of my meditations. I believe the healing prayers contribute to this significantly." --T.F., publicist, New York. "After reading Susan Shumsky's Divine Revelation, I know in my heart this is what I've been searching for in my quest to be able to contact God within me." --P.Y., Clinton Twp., Mich.
"I am currently reading your Divine Revelation. I mean, I am reading it over and over again. You probably will not be surprised when I say that it is an amazing book. Please accept my deepest respect and gratitude. God bless you." --J.C., Braintree, Mass. "I can't tell you how much I have enjoyed your book. It made it all so simple compared to what I was doing." --B.S.D., Rhinelander, Wisc. "Divine Guidance showed me your book. Just recently I disassociated myself from a worldwide spiritual organization and like to practice listening to my inner voice with more assurance, so I can get answers from within. Your book Divine Revelation is the most helpful how-to book I've come across." --R.C., Tucker, Georgia. "I recently obtained a copy of Divine Revelation and am tremendously impressed. I feel richly blessed to be introduced to this teaching. Thank you very much." --H.W.B., Hayesville, N.C.
"I feel so blessed to have just received Divine Revelation from 'One Spirit.' I'm sure I will make much spiritual progress." --M.L., Tacoma, Wash.
"I have been singing the praises of your book since I took the Breakthrough Intensive course in April this year in New York. Thank you for a great experience. I have been benefiting from getting wonderful guidance, etc. and I have integrated the Divine Revelation meditation into my prayers, etc. It is working wonderfully and I have gained so much confidence in my intuitive abilities. Hope you don't mind, but I will be telling many people about your courses!" --M.F., New York, N.Y.
"I found Divine Revelation to be very helpful in helping me to connect with my higher self. I have studied this subject for a number of years and I consider this book to be one of the best (and straightforward) that I have read. I would like to thank you for helping people who are on the path of enlightenment." --D.K., Bayonne, N.J.
"Staying for a few months in India, I was led to Divine Revelation. Thank you so much!! I have tried many ways of meditating, never being really successful. And now, by only reading it through, I already feel encouraged, full of love!" --M.G., Herzogenbuchsee, Switzerland. "I just finished your book. My inner knowing says, 'Susan speaks the truth.' I look forward to applying your principles of meditation, healing prayer, discernment, and expression in my efforts at personal transformation, and your truth serves as a welcome light on the path to spiritual realization. Thank You! Peace." --M.O., Salem, Oregon. "Divine Revelation by Susan Shumsky is great. It has helped me in several ways like breaking psychic ties with those who put me down and criticize, at the same time wishing these people well and asking for their highest good. I've also learned how to protect my energy field (aura) and what a change that has made! I am more free to be me. The book has also helped met to be more open to the guidance and comfort that Holy Spirit is always giving us, and to test for truthfulness. I am more aware now of being proved for abundantly and ahead of time. My life is easier." --J.T., San Diego. "I just completed Divine Revelation for the second time. I cannot tell you what an impact this book is making in my life. I've been reading a lot of getting-to-know-myself books, healing-myself books, but I haven't read anything like Divine Revelation. I love it! It feels as though it was written just for me. I am learning how to finally love myself, heal myself, and overcome this loneliness that I am feeling. I've been memorizing the healing prayers and saying the affirmations daily. I really do feel like I have power within me. I'm starting to feel something great inside." --L.K., cancer patient, Lansing, MI. "I have recently read your book. I wanted you to know what an awakening experience it was for me. I am 39 and at a stage of my life where I want to explore my spiritualness and my true reason for being on earth. I believe your book was an important first step in a process of finding my true self and the correct vocation for my talents." --J.C., Wilmington, DE. "Thank you for your book. It has helped me through some difficult experiences." --P.C., Austin, TX. "I found your book Divine Revelation to be very helpful on my personal spiritual search. Thank you." --M.S., Phoenix, AZ. "Thank you so much for writing your wonderful book and teaching what you have learned. Much gratitude for your magnificent work." --R.W., Seaford, DE. "I read the book Divine Revelation and I have never been the same. I want to go within daily. . .Please let the author know I thank my Creator for her." --M.F., Little Rock, AR. "Thank you for your magnificent book which I have not as yet fully digested, fully explored, nor adequately appreciated." --E.M., Monroe, LA. 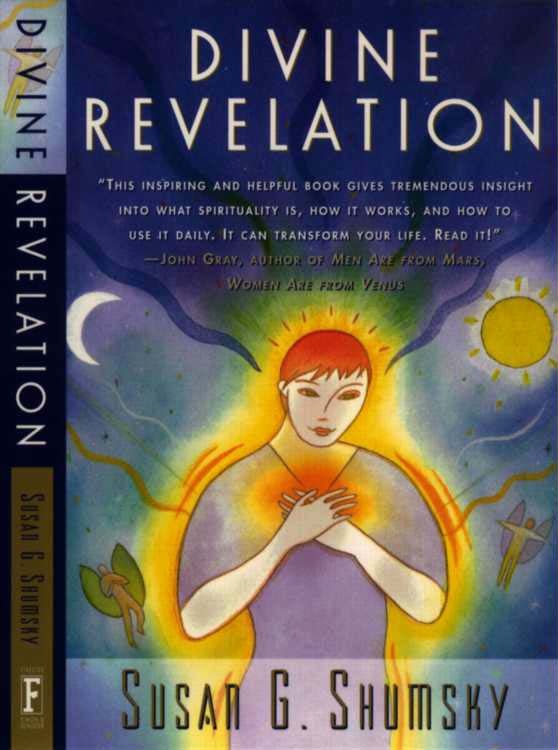 "I have just finished Divine Revelation by Susan G. Shumsky, a wonderful book. I was so inspired by his book. I think I have become a better person." --S.E., St. David, AZ. "The book is soooo good. I recommend it to everyone. As far as I'm concerned, it is the most responsible and informative book about spirituality I've ever read. Thank you! God bless." --D.A., Franklin, NC. "The book Divine Revelation has been an inspiration and a joy. Thank you, and May God Bless and Keep You! --W.H., Selma, AL. "I am thrilled with your book and your work! I have been communicating verbally and otherwise with the Divine Feminine for years but I felt on very shaky ground: alone, isolated and full of self-doubts. Lately, I have been receiving clear teachings from the Divine Feminine (Also known as Great Goddess) for the new millennium. Communicating with Her is on the top of the list! Divine Revelation, your work, fits into Her plan for us! Your work grounds me, confirms my vision, and my "Divine Revelation." Better: it gives me tools to teach the Art of Sacred Communication to my students. My mission is to open women to the Divine Feminine and empower them as well as to impart Her message and Teachings to everyone. So: Dearest Susan, Thank you, thank you, thank you! Blessings of Athena and Isis." --N.T., Edmonton, Alberta, Canada. "The material in your lecture, book, and tapes is by far the most useful and healing mindshift I've experienced in ten years. I trust my discrimination now: when I read or hear speakers, I can check in and know whether the material is coming from the highest source. There is nothing to fear!" --L.A.L., Houston, TX. "Confirmation that intuition really exists! Thank you! So often in my life, I have had that nagging feeling in my "gut" that I should, or should not do something. Too often I did not listen to that little voice (or as some call it "intuition") and later I had to live with bad decisions. Divine Revelation was a revelation of sorts for me, confirming that we are provided with spirit guides, certainly the guidance of our most supreme master, God; each who help us with every day decisions, if only we will listen. Divine Revelation was also "divine" for me and has helped me to finer tune-in that which each of us are surely blessed; that little inner guidance system that ensures that we will succeed or be saved from anquish. I now listen carefully! Thank you Susan Shumsky for your eye-opening little book. I only wish it had been around to help me with many of my wrong decisions in the past thirty-plus years. My future is now much brighter. I recommend this book to all who believe that we do not go through life alone!" --A.M., Newark, N.J.
"Trust me, it really works!! After 25 years of meditating, I had my first "Divine Revelation" today, thanks to Dr. Shumsky's technique. It worked the first time I tried it. I didn't even think it was going to work and it did. All I can say is that it was amazing and I'm going to order her book for family and friends." --P.V., Ohio. "From the bottom of my heart, I must thank you a billion times for writing Divine Revelation. It has touched my life and it meant a lot to me-more than anything else in the world. All my 18 years I was always searching and seeking for God, trying to find the truth, find the purpose of my life. I am sincere and desperately want this wonderful and loving relationship with God. I must say that anyone who happens to come across this book is one of the luckiest and most fortunate person on earth. To realize that God is within each and everyone is the most wonderful thing that could happen to anyone. . . Now I have one of the most precious books on earth to guide me though this." --Thaddeus Sun Sheng Cai, Singapore.